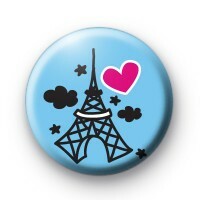 The Eiffel Tower blue button badge with a black Eiffel Tower illustration and a big pink love heart. Perfect for any trip to the city of love & romance, Paris. The Eiffel Tower is a famous landmark in Paris, France. All of our button badges are 25mm button badges made from metal and a plastic coated design with a copper pin back.